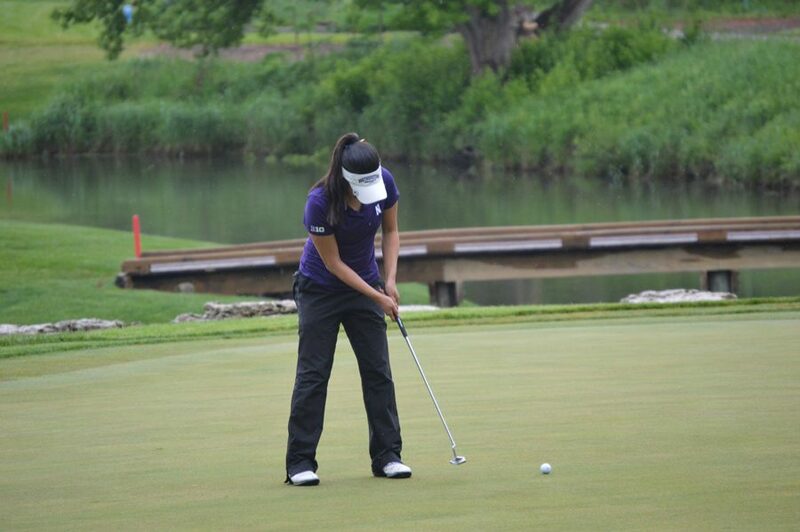 Hannah Kim strikes a putt. The senior won both of her match play matches at the East Lake Cup. Last season, Northwestern, Arizona State, USC and Stanford competed in the NCAA Championship match play semifinals. This week, they reconvened in the East Lake Cup, with vastly different results. Last year, the Wildcats finished second, taking down the Trojans in the semifinals before dropping the championship match to the Sun Devils. This time, they lost their first matchup to USC before falling to Arizona State for the second time. The Trojans, who fell victim to a furious NU comeback in May, emerged victorious in the overall tournament, taking down the Cardinal in the final. The Cats, meanwhile, struggled in their two matches, dropping their first rematch 4-1 while battling Arizona State much closer but still falling 2-1-2 to finish in fourth place. Senior Hannah Kim was responsible for both NU victories, taking down USC’s Muni He 3&2 in the semifinals. Kim didn’t trail the entire match. Wednesday’s match with Arizona State’s Madison Kerley was much closer, with Kim falling behind early and not taking the lead until the 14th hole, at which point she took two of the final three holes to win 3&1. The first round seeding was determined by a single round of stroke play Monday, in which the Cats finished third. Junior Janet Mao led the way, tying for second, only one stroke behind the leader. In the 20-person field, however, senior Sarah Cho was the only other NU golfer to finish in the top half with a ninth-place finish, five strokes off the lead. The trip to Atlanta represented the end of the fall season for the Cats, who finished with three top-5 finishes in their four previous tournaments in addition to the East Lake Cup. Fletcher described the season as “above average” while adding they still haven’t had a complete team performance. Even with the team’s impressive results, NU will look to emerge stronger in February.